A return to old-fashioned postcard writing might just be the answer. When I visit my 90-year-old mother, she shows me a stack of picture postcards, tied with a blue ribbon, that I sent her long ago, each one with a beautiful stamp, each card telling of my adventures. I have a similar stack on my desk of cards from her, tied with a blue ribbon as well. Now my mother’s mailbox, like so many others, is only full of catalogs and requests for money from politicians and organizations promising to cure every scourge and physical affliction on earth, some legal, some bogus, and she cannot discern the difference. When she sits at her computer she can see up to 50 requests a day from some of the same people or groups, and many others. She wants to help them all. My mother, who wrote her master’s thesis on the poems of William Wordsworth and earned a degree in international relations from Johns Hopkins, is confused. When my adopted son became an American, my mother was at City Hall for the citizenship ceremony; on her lap, he held up his baby hand to swear allegiance to the United States. When my first husband got brain cancer, she helped push his wheelchair, and later she was there when my son needed to go to Little League. Now she firmly and simply believes she has to help every single person who contacts her, by telephone and through the mail and on her computer. The land line rings when I’m there. It’s a local organization asking for a donation and she says, in her polite voice, “Yes, I’m happy to donate,” and they say they will send her a confirmation in the mail. She does not know how to do texts, so when they come in, that is the only line of assault she does not see. Don’t get me wrong: I was brought up to give to charities. We had a foster child in Zimbabwe we kids wrote to every month. My husband works for an international relief agency. My mother still loves to go to the mailbox. “I dwell in Possibility,” she says, quoting Emily Dickinson. Every Sunday morning growing up she used to gather us children in the living room and read us poetry. 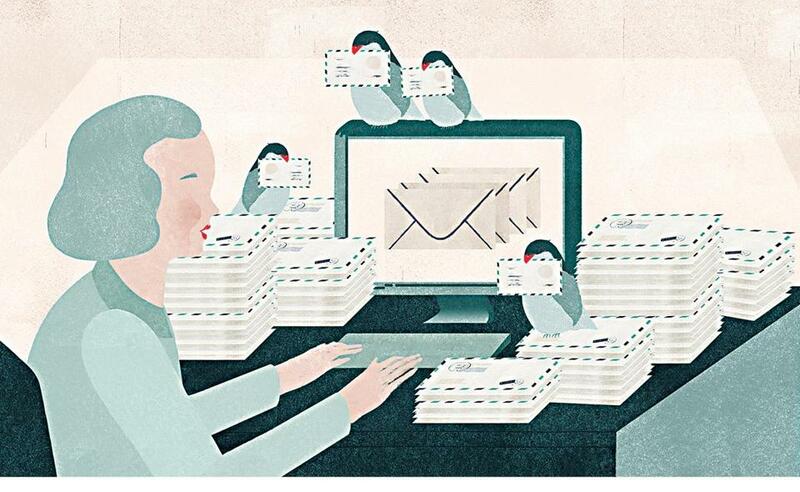 Now she loves to read e-mails from her grandchildren and watch videos of baby pandas tumbling in the snow and starlings soaring in their magnificent murmurations. I know, maybe it is time to take things away, her mailbox key and her computer, or she will lose everything. I understand. The summer I was 8, my mother took me to the local library every day. We kids were given a page with the outline of the library on it. Every time we read a book, we got a little sticker of a brick, and we put that sticker into the picture. It wasn’t supposed to be a race, because there was no reward, just a picture of the library made of brick stickers that we could hang up at home. My mother still has that sticker library on her wall. Patty Dann’s next book, “The Butterfly Hours: Transforming Memories Into Memoir,” will be published in August. Send comments to connections@globe.com.